Just a reminder: #OneWeek100People2019 starts April 8th! Just a reminder: we have around 1000 artists in the Facebook group ready to help each other cross the finish line next week. Just redraw weaker figures or missed lines right on top. Usually you can save the drawing. The misplaced lines don’t detract if you don’t think they do :) I find the pages with all the over-drawn figures more interesting. Use a small nib for finding contour, and the biggest nib you have for shadow shapes in contrast. I have a steel brush but you might also like a Parallel Pen if you don’t want to carry bottled ink. I use dipping nibs so I can change ink color on the fly, but you’d can always just carry more pens. I like a red line for variety from the black ink. Think about placement on the page – and scale – make some figures much bigger than others, for variety, and to include portraits in with full figures. Use the direction of the figures posture – and even the direction of gaze – to influence the composition. I like to use ‘disposable’ paper. These are pieces of Aquarius II folded into little booklets. I feel SO much more relaxed about bad drawings if they’re not in a sketchbook. It’s a phobia I have about ruining a book. People say don’t let it get to you, but if you can’t let go of the pressure to succeed – this is how I side step. Copyright is a pain in the a&& and artists should stop worrying about it. Because I’m a painter, I move around in a constant state of inspiration. Everywhere you go you see paintable things. You can’t look at the sky most days without seeing a great painting. Naturally, I’m also addicted to social media – just like most of you – I’m constantly inspired by images I see online. I’m also constantly anxious and afraid to do anything about that inspiration. For fear of Copyright Violation! (Cue Sinister Music). These regulations are always popping up in calls for entry, or in commentary about work online. As if painting in nature, standing in front of the landscape, isn’t just a copy? Or sitting with a model or a still life or some flowers. Artists are just the world’s most subjective camera. I am not a lawyer so this is my lay-informed opinion. Yes – diverting business income by taking work and re-selling it is wrong. Classic example: downloading artwork and making it into t-shirts. < (People have done that to me). Also, commercial use of a recognizable likeness of someone’s face – this is a theft of income. Every human has the right to be paid for the (commercial) use of their image. (Though, not in every legal jurisdiction. Personality Rights are not recognized in NYC for example). Same goes for commercial use of a building, a car, or even street art if it ends up in a photo. (Designers and Architects have the same rights). No direct, mechanical copy FOR PROFIT < this is common sense. NON-commercial use of anything (art, photos, likeness) is totally fine. Copies by students are an easy example. Copied work appearing in your illustration or portraiture portfolio is less obviously ok – but IS considered fair-use. (It’s a true demonstration of your skill, not a commercial product. The commercial product is the future work you might gain, not the copy itself). AND >>>> most people don’t know this >>> one-of-a-kind original art is almost always ruled non-commercial. The key difference being, art is (generally) sold once (or a handful of times). The intent is not mass production. Being inspired by an image, making (and selling) a TRANSFORMATIVE work is totally NOT copyright infringement. The existence of the new work does not in any way reduce the value of the old work. Often it actually increases value, by a kind of cachet effect. (The original work must be great if it inspires so many copies). Translating to a different media: Photograph recreated in line-art or weaving or say – an impasto oil painting. Creating a composite image: Use multiple images for reference. To be safe, take no significant amount, or at least, equal amounts from each. (eg: collage). Altering the source image: Enough that it would not be recognized by a stranger – not by the original artist. (They are too close to the issue). This also covers portrait-likeness. If a stranger (not the model) would not recognize the work, then you have not stolen their face – even if you admit to using their photo as reference. Doing all of these things is bulletproof, but any one of these transformations *might* be sufficient to be within Fair Use. (It’s up to the judge). Rules of thumb: Has the material taken from the original work been transformed by adding new expression or meaning? (Such as parody, or recontextualizing or juxtaposition). Was value added to the original by creating new information, new aesthetics, new insights, and understandings? That’s my rant about why it’s OK to think and act upon your actual creative thoughts. Every thought we think comes from somewhere. You see something, you read something, and you combine old ideas into new ideas. There’s nothing new under the sun. Don’t be ashamed of seeing a great painting or photo and thinking – man – I would love do my own version of that! All that said: you should still credit your sources. [Photo: Trina Davies, Playwright of Waxworks, Shatter, Silence, The Bone Bridge and the GG-nominated The Romeo Initiative; http://www.trinadavies.com]. It’s just good grace between artists, and, if you are confident you’re doing transformative work, then there’s no reason not to. I was sitting there cleaning some pens and packing a sketch kit – trying to remember the last time I went out drawing people? 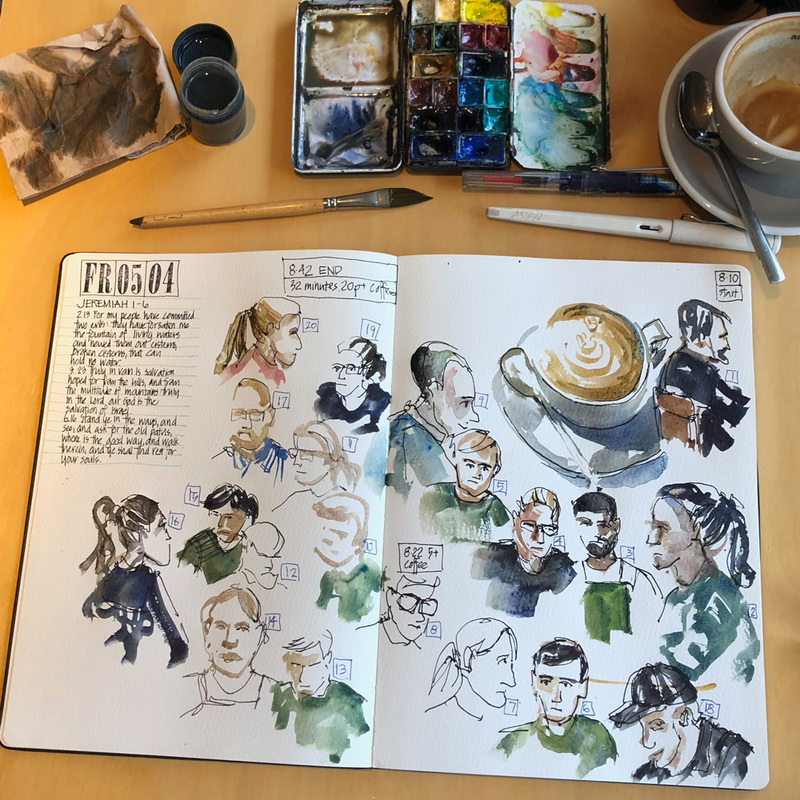 I know I grabbed a few sketches of sketchers last summer at the USK Mini Symposium in Chicago – but other than that – I haven’t gone out people sketching since 2018’s OneWeek100. For a person who used to go life drawing three times a week, that’s a weird situation. Frankly, I wasn’t even sure if I could do it anymore! You leave something for so long, you wonder if the skills magically vanish? I headed out for lunch at the mall, with just a ballpoint and some typing paper, going back to the very basics. Just checking – is it still there? I’m happy to say, it’s like riding a bike. The fingers remember how to lay down lines. But still – I’ve gone approximately a year without figure drawing – and not missed it that much – so what changed? Besides everything: eldercare madness, job changes, retiring from teaching, retiring from freelance work, and taking up studio painting. What does the new me, the artist I am today, want out of #OneWeek100People2019? After this dry run, I’m confident I could hit the streets, find some events, and get back into the groove. I could just have fun! Use sketching to get out to some stuff I’ve been passing up. Go to life drawing, check out the art gallery. Or just wander and see what the street has to offer. It could be like the good old days! I’m going to try to make some of the figurative painting I’ve been thinking about for a few years. < Yes, that’s a little cryptic :) But let’s say I’m going to be pushing my figures in a Direct Watercolor approach – and I won’t be sticking to documentary / reportage. This year I want to be working without the pressure of live-sketching. But I’m going into this cold. I don’t exactly have a solid plan for these imaginary awesome artworks. So you’re going to see me making it up as we go along. Maybe some of you are thinking about your own week? Drop me a comment! What are you going to take on this year? What’s your plan for #OneWeek100People2019? The floor is yours in the comments section!